You can keep cool during the summer by using breezy bedding ideas. The right colors and fabrics infuse hints of summer with a few additions to your existing bedroom décor. Strip the bedding and replace it with cooling sheets and a lightweight bedspread. Your style may be more that of a lightweight duvet or comforter. Summer colors are bright and vibrant. Think blue skies, green lawns, and fields and colorful flowers. You can use as many of these colors as you like for your bedding. Choose colors that go with your existing décor. Change your green bedroom by introducing bedding with blue, yellow, and green colors. You can select a pattern or print bedding ensemble the highlights all three colors. Continue the summer splash of color with blue and yellow decorative pillows and shams along with a striped, plaid, or solid-colored throw. If your bedroom is a dark or medium blue, introduce lighter blues for a monochromatic bedding ensemble. You may prefer three different blues broken up with white accents. You can select either solid colored bedding in varying values of blue from navy to pale blue. A mix of solid colored bedding can be accented with a plaid of several blues on a white background. White bed linens can be used to break up the blue and give a lighter overall bedding style. A yellow bedroom is already a sunny space and can be ramped up by adding crisp white bed linens and a touch of summer green. A nice bedspread/comforter print set against a white background featuring green plants and yellow blossoms is ideal. Green, yellow, and white solid colors can be introduced using pillows and pillow shams that match the bedspread/comforter. You can create greater depth by adding a couple of striped or plaid pillows. Drape a yellow throw over the foot of the bed for a final touch. You can brighten up this room with pops of white. 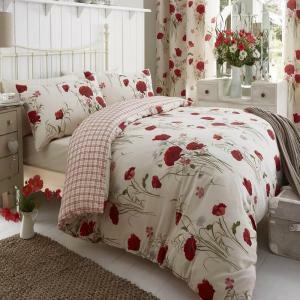 Select a summer-weight comforter featuring a splash of red poppies against a white background. Add solid colored red and white throw pillows in various textures that create a wispy feeling of summer breezes. A ruched fabric throw can provide additional covering when needed. You already have a leg up with either of these summer colors. You can add two more colors to this with your bedding choices. Consider adding green and either yellow or white for the second color in a bedding option. Crinkled/crushed taffeta: Taffeta is a polyester that has a rich elegant look. Crinkled crepe: This fabric has a puckered/wrinkled appearance. It is also thin and sheer and adds a touch of wispy summer breeze feel to any bedding. Cotton: The most breathable fabric is cotton. Soft cotton bedding is an ideal choice for a summer ensemble. Ruched polyester: If you're looking for an elegant fabric for summer bedding, look no further than ruched fabrics. The puffy gathering folds of this fabric in lighter colors or white can create the ambience of a fluffy airy bedding design that is very inviting during hot summer nights. Mosquito Netting: Whether you need it or not, mosquito netting can soften the look of a high poster or canopy bed while adding that wispy summer breeze ambience. The key to a successful summer bedding makeover is to think in terms of changing temperatures. Some summer nights will only require sleeping with a top sheet, while a cooler night may require a comforter/bedspread or a bed throw. You can accommodate fluctuations in summer night temperatures by layering different bedding linens. Place a summer weight bed throw on the foot of the bed or over the footboard in case the night grows chilly. Fold a lightweight quilt or blanket and place it across the foot of the bed for easy retrieval should the weather change. Select a lightweight bedspread or comforter made of cotton for an optimum summer slumber. You can keep cool during summer nights when you select proper summer bedding. Select lightweight bedding that goes with your existing décor for an economic change you'll appreciate during the hot summer months.